What is the PERMUT Function? The PERMUT Function is categorized under FINANCIAL functionsFunctionsList of the most important Excel functions for financial analysts. This cheat sheet covers 100s of functions that are critical to know as an Excel analyst. The function will calculate the number of permutations of a specified number of objects from a given set of objects. In financial analysisAnalysis of Financial StatementsHow to perform Analysis of Financial Statements. This guide will teach you to perform financial statement analysis of the income statement, balance sheet, and cash flow statement including margins, ratios, growth, liquiditiy, leverage, rates of return and profitability. 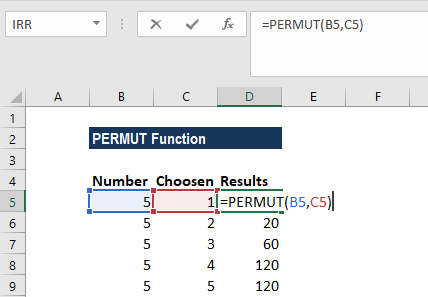 See examples and step-by-step instruction, PERMUT can be useful in calculating different possible permutations. So, it will help in rationally evaluating situations and making the correct choices on behalf of shareholders or clients. 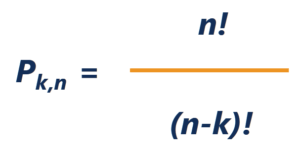 Number (required argument) – It is an integer that describes the number of objects. Number_chosen (required argument) – It is an integer that describes the number of objects in each permutation. 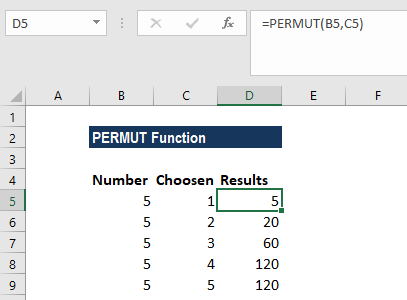 How to use the PERMUT Function in Excel? The number of permutations for a given number of objects is the number of combinations in each possible order. Note that permutations differ from combinations in that, for a permutation, the order of the objects matters, but in a combination, the order does not matter. The given number is less than 0. The given argument number_chosen is less than 0. #VALUE! error – Occurs if one or both of the given arguments is non-numeric. Arguments that contain decimal values are truncated to integers. A combination is any a group of items in any order. If the order is significant, we should use the PERMUT function. If the order is not significant, we can use the COMBIN function.